This is a repost from Geeky Pleasures. If you subscribe to Geeky Pleasures, I apologize for the double content. 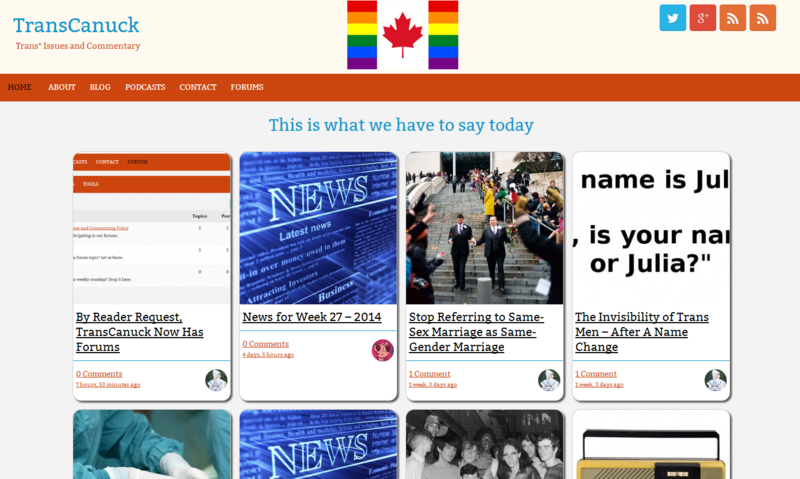 Very quietly on Canada Day, I launched another website called TransCanuck, the focus being trans* issues and commentary. Two trans Canadians—Marcy Cook and Jules Sherred—decided to form a partnership. We’ve yet to decide on a definitive format, but expect more news in the coming weeks; the focus is on Canadian trans life/issues, then wider North America and world life/issues. This is not a trans-activist website. It is more news and opinion based, with some fluff no doubt as we both have a sense of humour! We’re taking suggestions from the audience if you have them! * Likely: Weekly trans round-up of news. Eventual podcast. It is still very much a work in progress. Today, by reader request, I added forums to the site. Until Marcy and I figure out a more concrete direction, posts will be sporadic. That said, we still think TransCanuck is worth checking out and subscribing to the various feeds and following us on Twitter and circling us on Google+. I developed and designed TransCanuck. So, if you notice something that isn’t working right, please let me know via email.